Self-adhesive insulating tapes of synthetic rubber and foamed polyethylene with closed pores of thickness 3-4mm, width 50 mm, sticky layer piled on the one side. High percent content of synthetic rubber makes the product elastic and adaptable for any surface. Tape doesn’t melt, doesn’t contain smells, and has high insulating stability to condensation, corrosion, warmth and noise. Temperature range is from -45° to +85°. The resistance of dampness penetration, µ > 10000. Solidity is 60-65 kg/m3. The tape is used for insulating hot and cold tubes, especially in refrigerating plants and systems of air conditioning, and also where the fine insulation cannot be done. It is indispensable when working at hard available places, near the valves and branch-tubes, and also to protect insulation connections. The surface, which is subject to insulate, has to be degreased and dried for the insulation work. 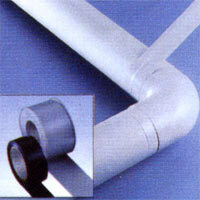 A sticky tape of pure aluminum and PVC is with sticky layer and protective paper film. Tape sticks well to any surface. It is light, handy have good sticky qualities. It is used for connecting elements of insulation surfaces, covering tube and canal’s seams, and others elements, aluminum insulated materials. Length of roll is 50 m, width is 50, 75,100m, and thickness is 30, 40, 50 microns. A sticky tape of PVC of grey and black colors AT007. Special sticky tape of PVC for connecting the elements of insulation surfaces seams decoration or sticking the material. Tape length in roll is 25m; thickness is 25, 38, 50 mm. "LISOLANTE K-FLEX" company offers special brackets for tubes of various diameters. The using of the brackets allows avoiding damage of insulation in places of supporting the tubes and creating "the cold bridges", which are the reason of appearing the condenser. The thickness of the bracket selects according to the thickness of tube insulation. Open the bracket; cover it on the tubeline at the place of the support position. Pile the glue K414 on the surfaces connecting of two halves of brackets and press them. Fix the steam by self-adhesive rubber placed on the external perimeter of the bracket. Fix the metal collar around the bracket. The construction of the knife allows you to make quickly the straight longitudinal sections on the insulation tubes. It is necessary to use only sharp blades to avoid curves and breaking the material. Straight section allows you to make adhesive seam easy and high quality. Carefully, not to touch cut surfaces, lift the blade along the tube. Clean the surface with the help of "K-Flex" cleaning. The right choice of insulation and optimum one of the instruments and auxiliary components allows you to get maximum effectiveness of installation. Don’t use the glue K414 of overdue applicable life. on’t use the glue K414 of overdue applicable life. When working with tins of 2.6 liter, pour some glue to another container and fill up if it is necessary. Close the tins tightly if they are not in use. For diluting the thickened glue "K-Flex K414" use the "K-Flex" cleaning. When sticking the "K-Flex" material over the all square, glue K414 has to pile firstly on the term insulation and secondly on insulated surface. Do not work with disconnected systems. It is necessary to leave the insulation for 36 hours for drying before turn the system on again. Do not use the glue K414 in the sun, when temperature is less than +5°C and more than +30°C. The optimum temperature for using is +20°C. Pile the glue once by thin layer on the both stick able surfaces; use the brush with short harsh bristles. Wait until the glued surface dries (touch the surface and make sure that there are no "threads"). Connect the insulated "K-Flex" surfaces and press them for the short period of time. Do not stretch the material while sticking the seams, it is better to press them. Make sure that glue K414 is consistent and stick able to the certain paint. Use only chromo zinc anticorrosion surfaces and solvents. Do not pile the glue K414 on the surfaces, which contain asphalt, bitumen and flax-oil. The time of glue drying: 36 hours. Keep in fresh places; keep from freezing. Serviceable life: 1 year. Glue consumption: 0.2 - 0.3 liters on m2 of surface. The surface sticks excellent to any insulated surface. It is easy and handy, self extinguished and doesn’t melt. The surface protects the insulation and improves outward appearance of all small and big cylindrical tubes. The tubes are insulated with the help of material of foamed rubber, grassfire and mineral wadding, polyurethane cork material and polystirol font. Protective surface. 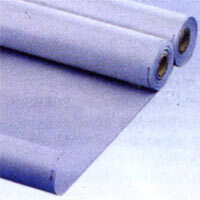 Hard PVC is the shell of smooth grey surface in rolls. 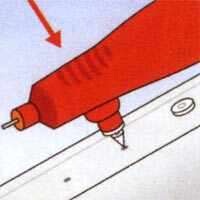 It is easy to install and fixes by plastic rivets. The connecting of surface elements of PVC makes with the help of sticky tapes AT 007. ОIt is used as a protective surface for tube and leaf insulation. Contains of 99,5% of pure aluminum. Plastic and metal rivets and install awl are the necessary equipment for correct installation of protective surfaces of PVC and aluminum shells.